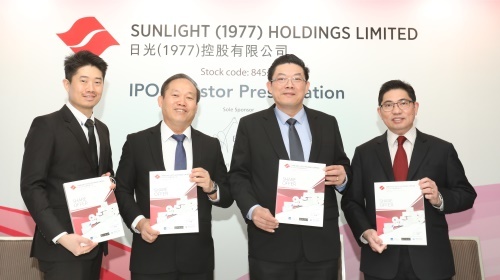 HONG KONG, Mar 27, 2018 - (ACN Newswire) - Sunlight (1977) Holdings Limited ("Sunlight" or the "Group"), a leading tissue products supplier for corporate customers in Singapore, announced the details of its proposed listing of shares on GEM of SEHK under the stock code 8451. The Group intends to offer for subscription or for sale, as the case may be, an aggregate of initially 200,000,000 Shares of nominal value of HK$0.01 per Share in the share capital of the Company ("Offer Shares") by way of Public Offer and Placing in connection with the proposed listing of the Shares on GEM of SEHK. The indicative offer price range is between HK$0.25 and HK$0.30 per Share. After deducting underwriting fees and estimated expenses in connection with the Share Offer, assuming an Offer Price of HK$0.275 per Share (being the mid-point of the indicative Offer Price range of HK$0.25 to HK$0.30 per Share), the net proceeds which the Group will receive from the Share Offer is estimated at approximately HK$30.0 million. In order to provide a reliable and stable supply of products to customers, the Group has implemented internal policies to maintain a healthy inventory, and it has its own conversion facilities in Singapore for producing jumbo roll tissues, which allow it to accommodate unexpected increases in orders and/or urgent orders with ease. The Group's in-house logistics team helps to ensure timely delivery of purchase orders as well. Further, the Group visits its key suppliers and tissue paper mills that provide its raw materials regularly to ensure consistent quality of its products. The Group's management team comprises highly experienced professionals in the tissue products industry. The team possesses in-depth knowledge and experience critical to the Group's success in the tissue products industry for corporate customers. It is capable of seizing market opportunities, formulating sound business strategies, assessing and managing risks and implementing management schemes, so as to help the Group maximise shareholder value. With Singapore's well-developed infrastructure and active public support for health and sanitation, which encourage the use of tissue products in public places, the consumption value of tissue products in Singapore is expected to continue to grow steadily at a CAGR of 3.5% between 2016 and 2021, reaching SGD198.1 million, and the total consumption value of tissue products for corporate customers to account for over 59% of the entire market by 2021. The consumption value of tissue products by corporate customers will continue to grow at a CAGR of 3.8% in the period to reach SGD117.0 million. Founded in 1977, Sunlight (1977) Holdings Limited, based in Singapore, is a leading tissue products supplier for corporate customers. The Group provides a comprehensive range of tissue and hygiene-related products and services for customers, and is the first and only jumbo roll tissue converter in Singapore*. With an operating history of around 40 years in the tissue products industry, the Group has developed a comprehensive customer base with customers from a wide array of industries, including facilities management and cleaning, hotel and leisure, and food and beverage industries.